Impulses consist of a list of inputs from various sources, that help you track your time by showing you your past and today's planned tasks or events. The information for the Impulses comes from projects, tasks, previous time records and external applications such as the Google Calendar, MS Exchange Calendar and Basecamp. Keeping track of what has been done. Taking advantage of the information coming from external services and registering them in order to keep track of the real time you are spending on your tasks. Timeline: You will find here the list of previous time records and information from Google Calendar and MS Exchange Calendar. 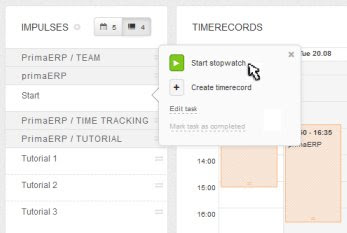 Impulse from Tasks: You will find here the list of your projects and tasks from primaERP TIME TRACKING and Basecamp. 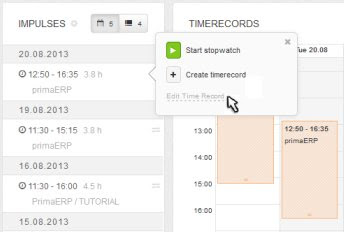 B) Within the Agenda: You will find the list of your projects and tasks from primaERP TIME TRACKING and Basecamp. 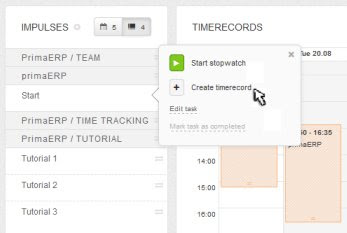 You can quickly create a time record by dragging and dropping an Impulse to the calendar or simple clicking on an Impulse and then selecting the option "Create Time record." This action is done only in the "Timeline" section. Click on the Impulse to be edited and select the option “Edit time record”. This action is done only in the "Impulses from tasks" section (left side, left tab). Click on the Impulse to be edited and select the option “Edit task” or “Edit project” as appropriate. Here you can also mark the task as finished by clicking on "Mark task as completed". Note: you will be able to edit the information of projects and tasks recorded in primaERP but you will not be able to do this for information from external sources. By connecting external services such as your Google Calendar, MS Exchange Calendar or Basecamp with primaERP TIME TRACKING, you will be able to register the real time you spend while you process of the planned activities with a single application. At the bottom left of the Working Panel you will find the Impulse button. By pressing this button, the Impulse panel opens and there you will find the list of projects and tasks. Plan your day by selecting projects and tasks to perform. We recommend being realistic and schedule only what you really can manage to complete. Tracking your time: Track the time of your planned events working in the Agenda. C) Here you will see the Impulses that can be configured. Keep in mind that in order to set up the Impulses for the external services, you should connect them first. You can select to show or hide information by pressing the respective button. You can choose the number of previous days to show. In the case of the Google Calendar, you can select the calendar you want to sync. For the MS Exchange section, using the Edit button allows you to enter the calendar link.